Did you know that brown diamonds show more flashes of colored light than “colorless” diamonds? If you are in the market for brown diamonds, be sure to ask your jeweler for an AGS Laboratories Colored Diamond Document. It’s a grading report that presents the technical aspects and nuances of colored diamond grading to jewelry buyers with easy-to-understand verbiage and graphics. 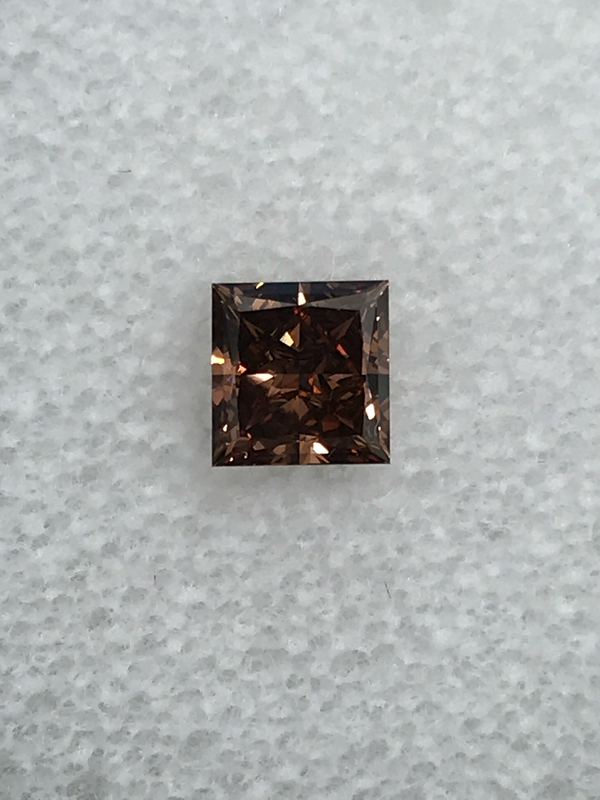 Brown diamonds will no longer be described simply as “a brown diamond,” but will be communicated visually, highlighting the nuances within the diamond’s color. 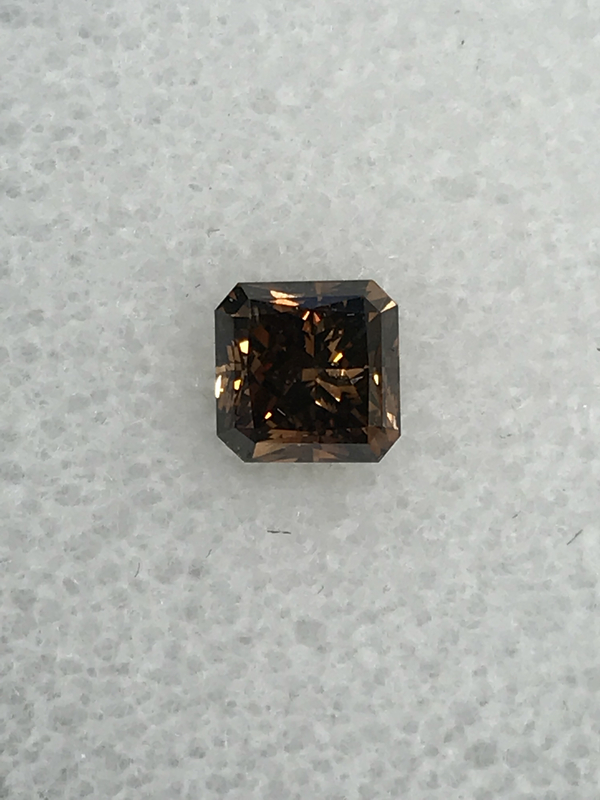 For example, a diamond with even distribution of brown throughout and hints of orange, could be described as a deep, rich, brown diamond with moderate orange accents. Click the image below to view the Colored Diamond Document. AGS Laboratories encourages jewelry buyers who are shopping for diamonds to always ask for a diamond grading report from an independent third-party laboratory so that they can better understand the quality of the diamond they are buying. 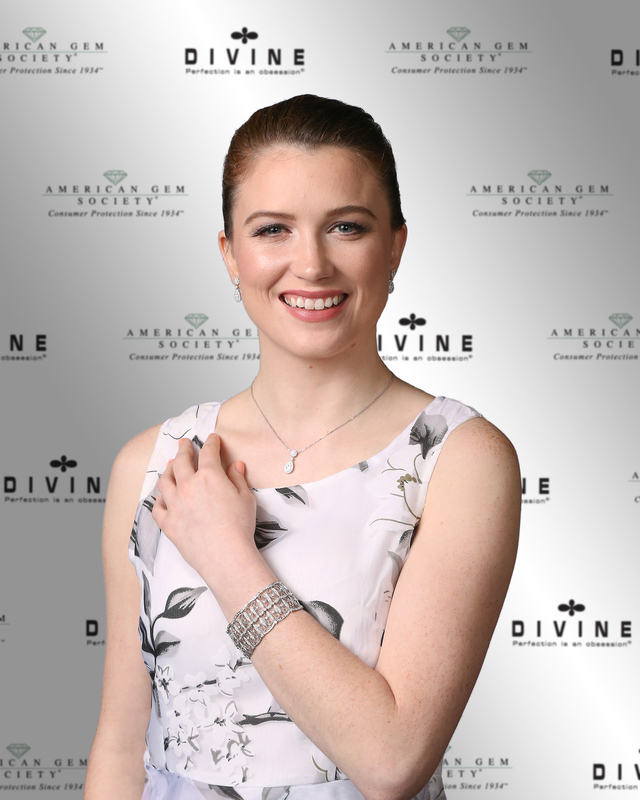 To find an American Gem Society retailer, visit americangemsociety.org/findajeweler. 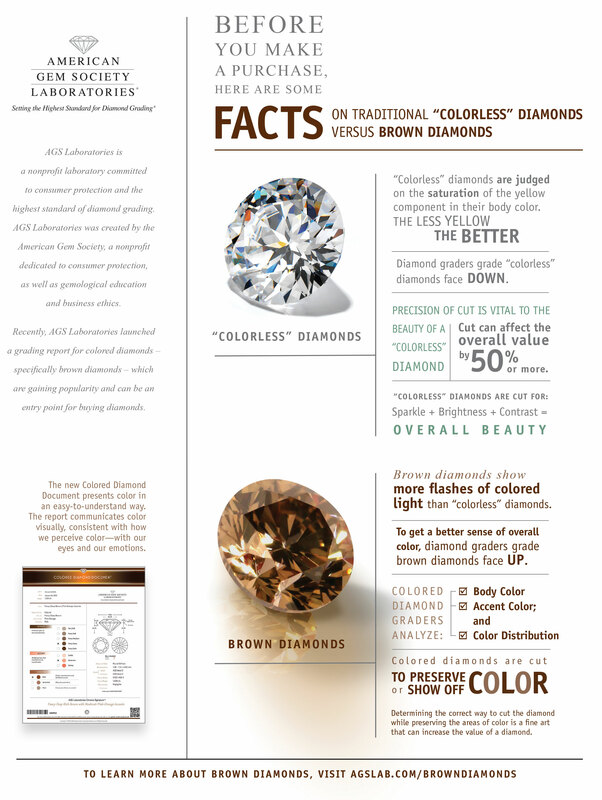 To learn more about AGS Laboratories Colored Diamond Document, visit agslab.com/browndiamonds. 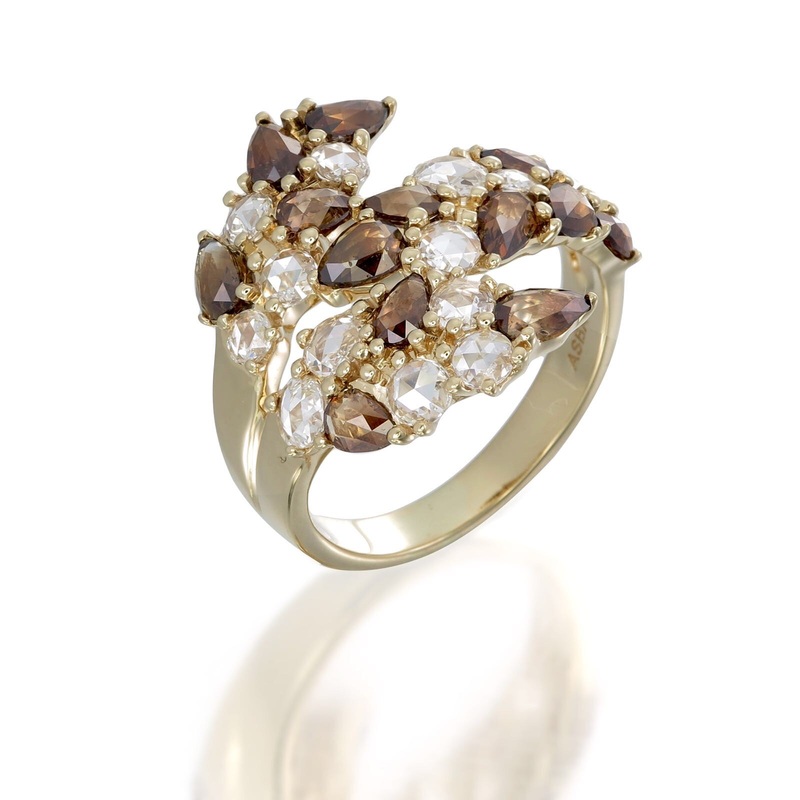 Here are a few designs we love from members of the American Gem Society that feature brown diamonds. 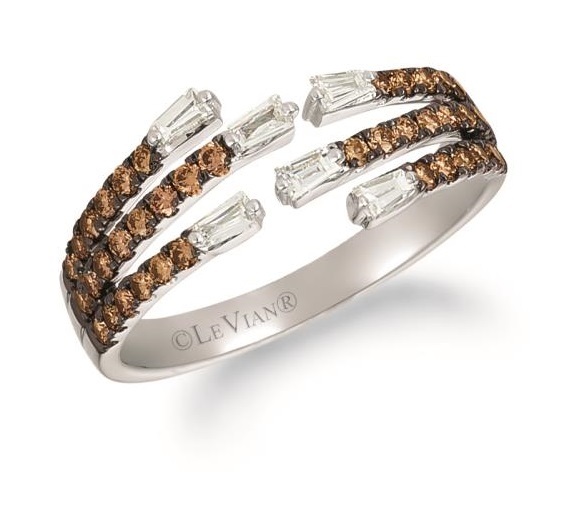 Brown and white diamond ring, by ASBA USA, Inc.
Chocolate Deco Estate™ cuff, by Le Vian. 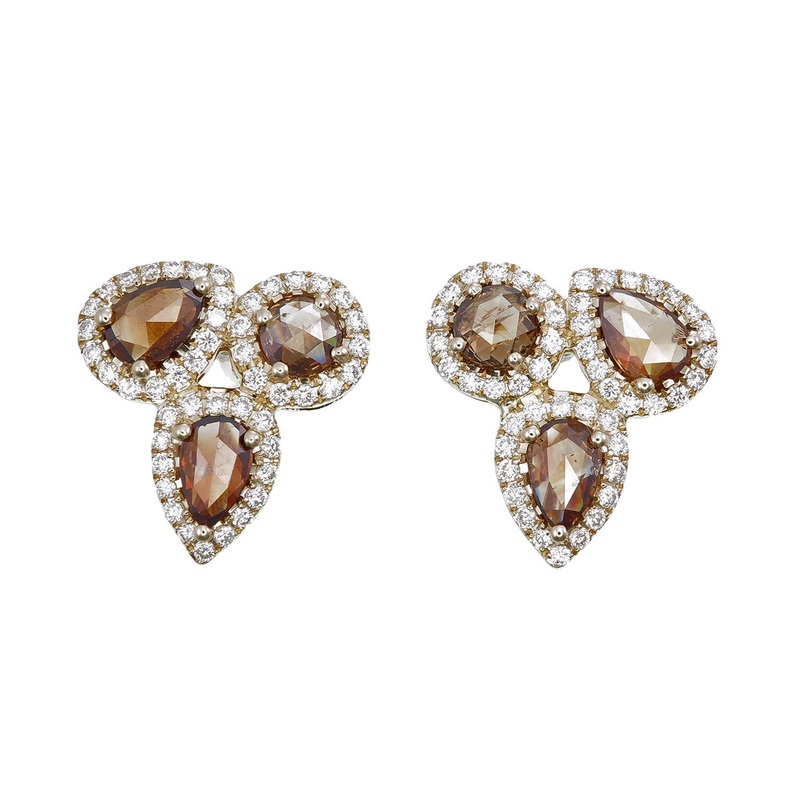 Brown and white diamond earrings, by Dilamani. 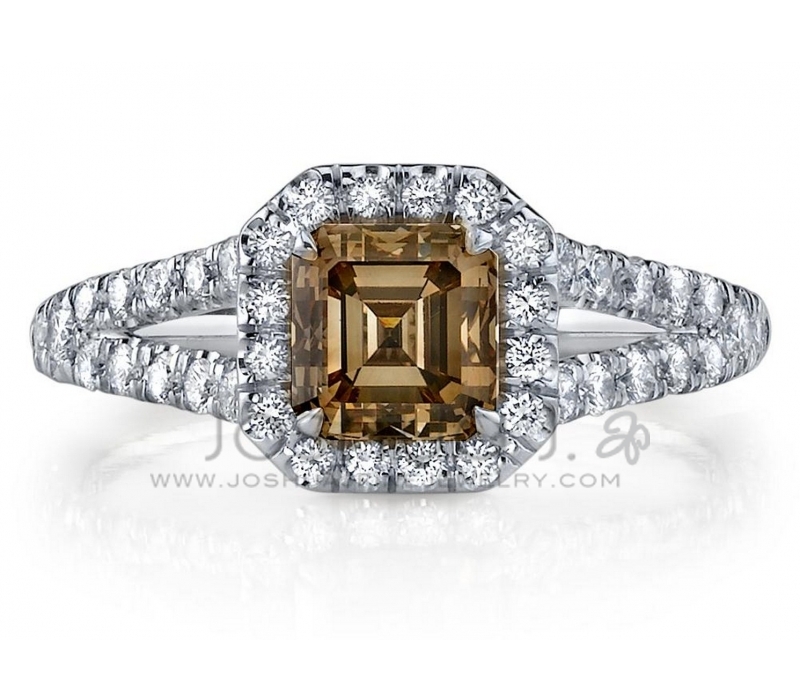 Asscher cut cognac diamond, by Joshua J. Fine Jewelry. 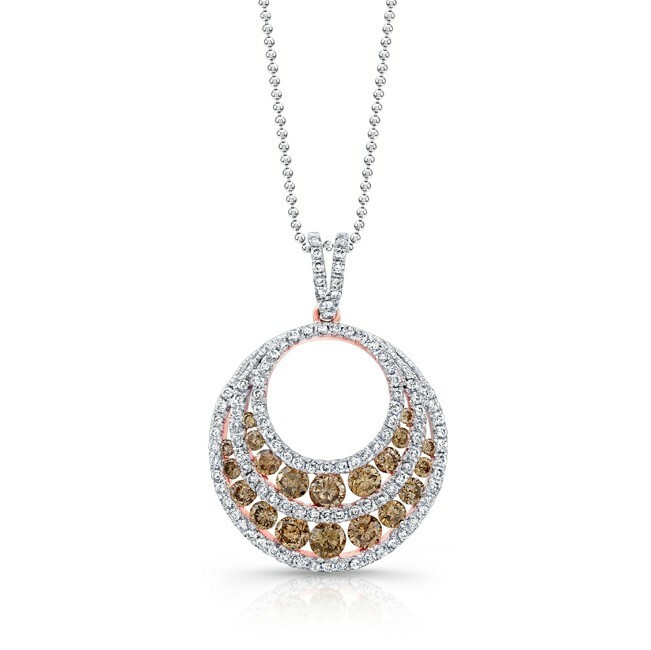 Brown diamond and white diamond pendant, by MK Diamonds & Jewelry. 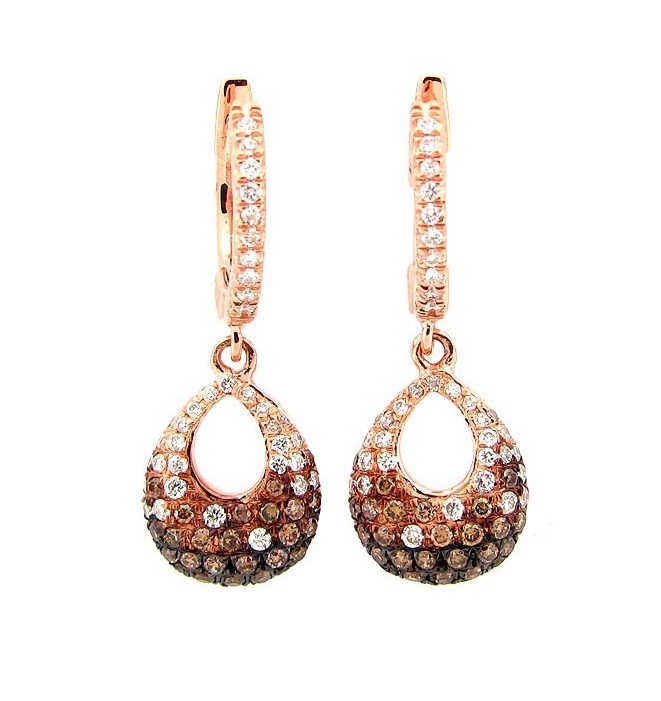 Diamond and brown diamond earrings, by Supreme Jewelry. Choose it for Love. Buy it From a Titleholder. Buying jewelry can be intimidating—it’s a bit like buying a home. It’s a big purchase and you need help from qualified professionals—that you trust—to close the deal. And it’s an emotional purchase; it can represent a big life change. This is experience talking. I recently bought my first house. It was scary. How was I supposed to spend so much money on something that was so unknown? I had the comps, knew the area, knew the specs of the house and all the data and statistics. But that wasn’t enough. How did I know if there weren’t issues that I couldn’t see? What if the foundation was cracked, or there was mold behind the walls? What if there was a weird smell no one knew the cause of? That’s why I brought in the experts. I had an amazing real estate agent who knew the area and even researched the owners. I had an appraiser that was ethical who refused to raise the appraised value of the house beyond what he thought was fair. I had an inspector who I trusted to come in and point out every little issue that could be a problem later on. These professionals were people that I trusted. I knew they had their professional credentials and licenses. They were experts in their fields and most importantly, upheld standards of practice. This is the exact same reason why you need an American Gem Society (AGS) jeweler when making a jewelry purchase. 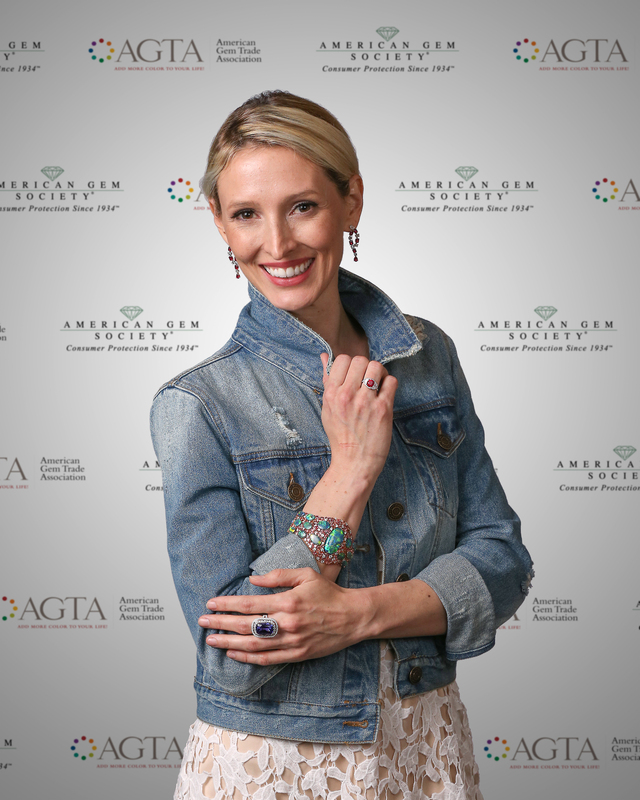 These jewelers are AGS titleholders, which means they are professionals who have pre-requisite gemological or jewelry industry education, verified by the AGS, and then tested by the AGS in their proficiency to grade diamonds. Not only that, they are required to write a Recertification Exam every year to ensure they are up-to-date on the most recent developments in the jewelry industry. If they do not take the annual exam, they cannot maintain their title. More than being knowledgeable, AGS titleholders are also required to sign an ethics agreement every year and are required to uphold the AGS standards for protecting you, the customer, every day, and in every interaction. Why shop with an AGS jeweler? For the same reason you see a certified professional accountant (CPA) to do your taxes, or a doctor that not only has a medical degree, but has their board certification, or the reason you rely on experts with any major purchase, investment, or life event. An AGS jeweler is there to protect you, their customer. They are there to give you the information you need to make an informed buying decision. Yes, they are there to sell you jewelry, but more than that, they are there to share their passion for jewelry and help you celebrate the moments and reason you walked into their store in the first place. Ask your jeweler, “Are you an AGS jeweler?” If not, find one that is. As a credentialed gemologist, Alethea has some favorite gemstones, although it’s not easy to narrow the list down to just a few. Click below to get a closer look at these beautiful gems! 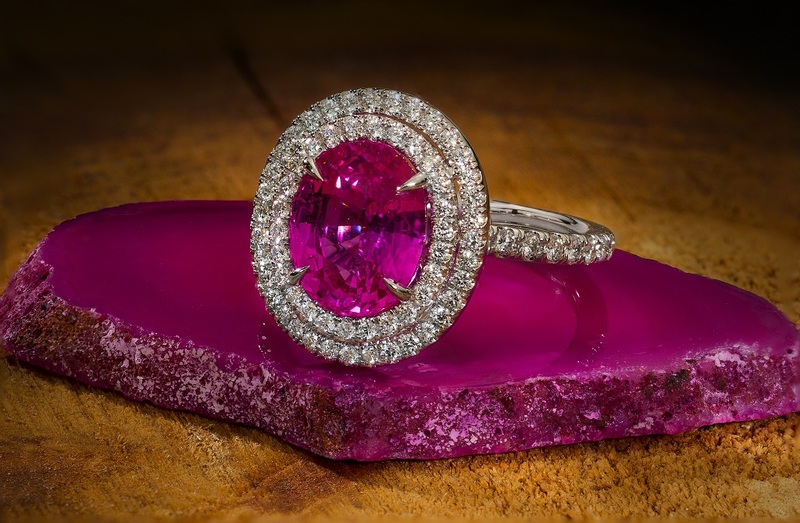 Cushion cut pink spinel and diamond ring, by Omi Privé. 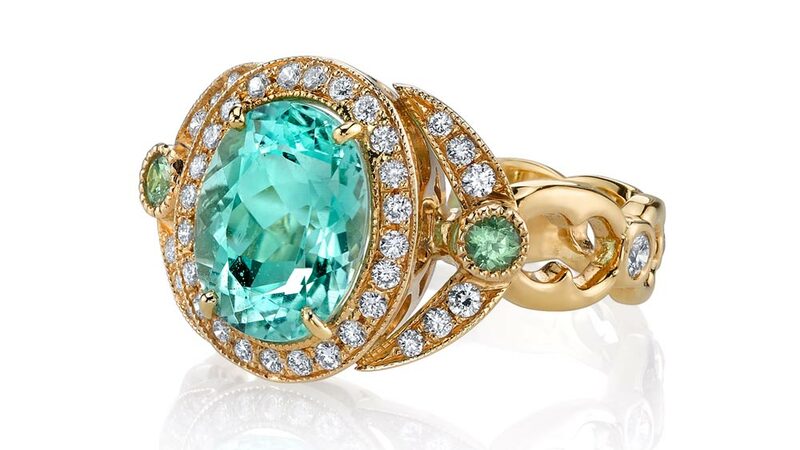 The 18k gold “Eva” ring features Paraíba tourmaline, demantoid garnet, and diamonds, by Erica Courtney. 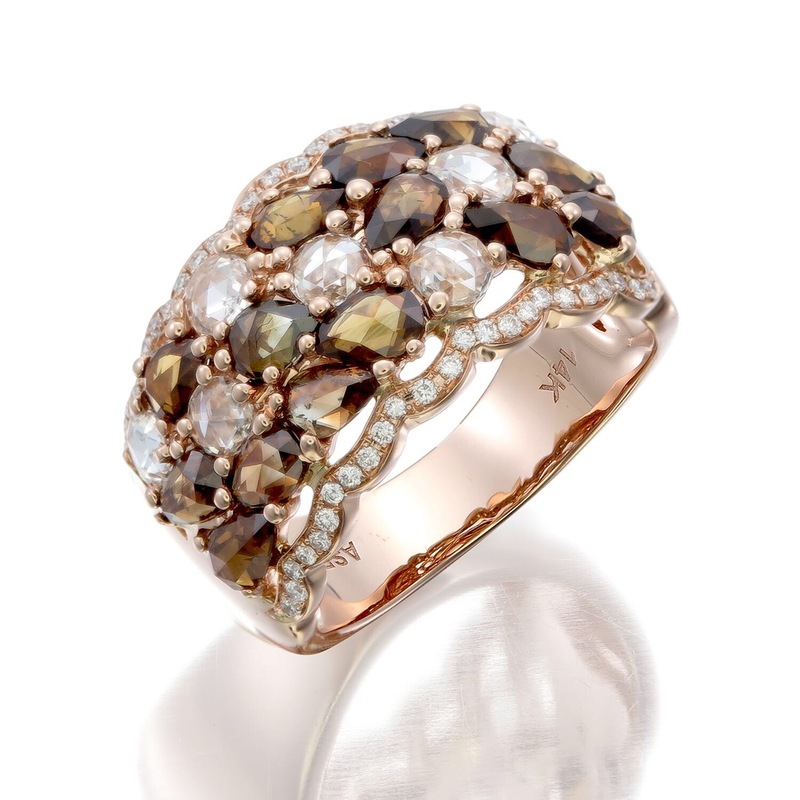 This ring, by Le Vian, features Chocolate Diamonds® and Vanilla Diamonds®. Russian demantoid and diamond ring, by Michael Schofield & Co.
You may think this big, beautiful diamond in the ring below is a brown diamond. It is, but it’s so much more. This is a fancy, deep rich diamond with moderate orange accents. 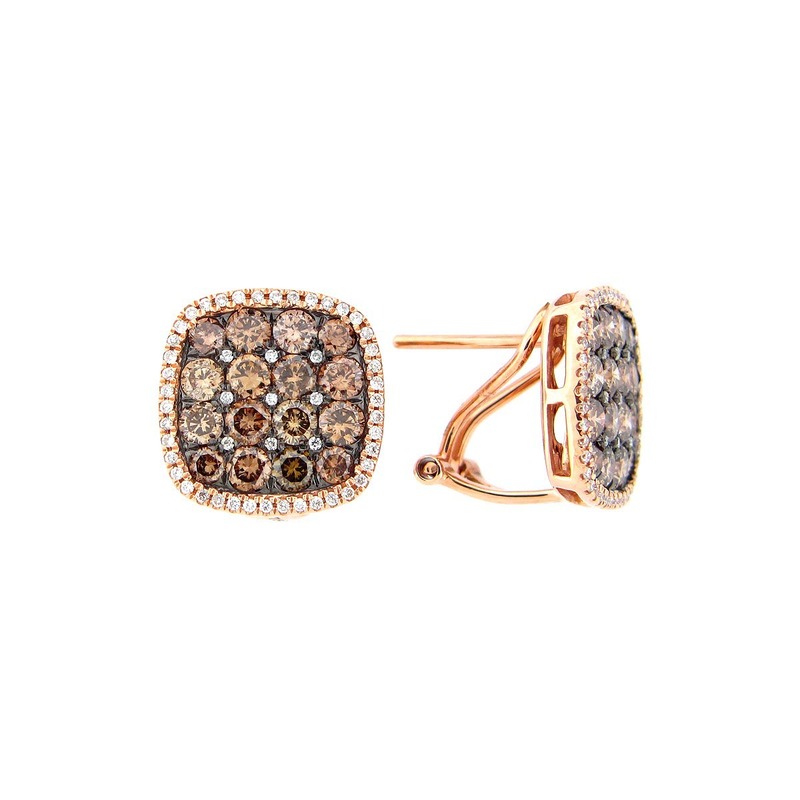 Brown diamonds are beautiful, and they vary in their intensity of color and warmth. What adds to their beauty are the accents of different color. 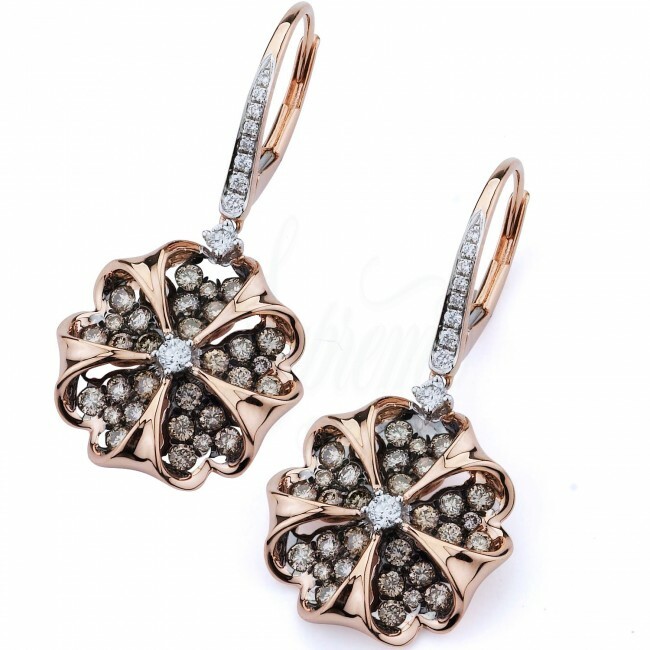 Brown diamonds—in fact, colored diamonds in general—usually have more flashes of colored light than colorless diamonds. Their accents can range from pink, red, orange to even green. It gives them depth and adds to their romantic allure. 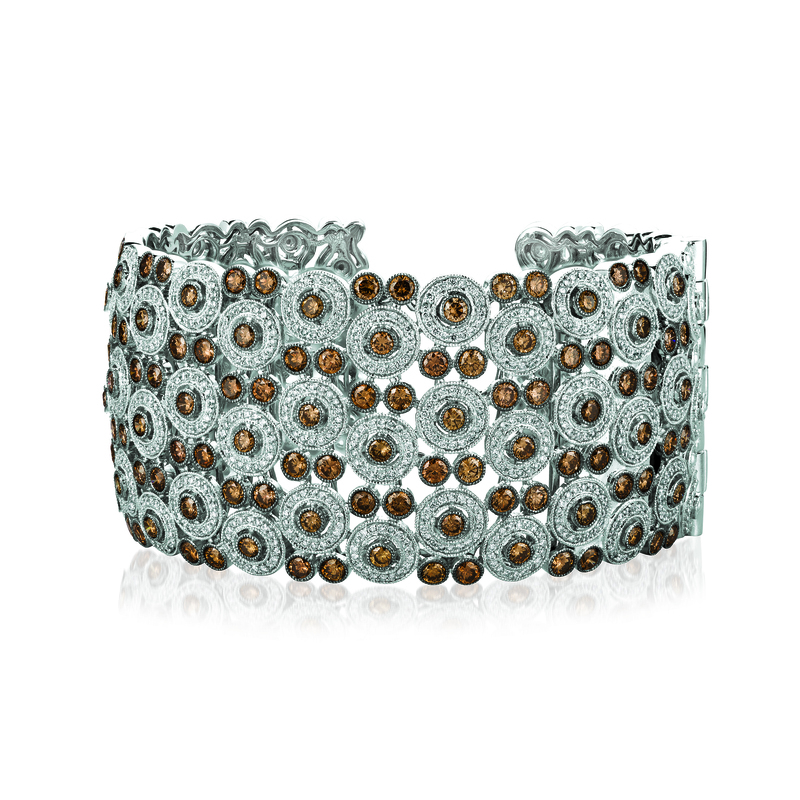 Brown and white diamond bangle, by Dilamani. To show how two brown diamonds can vary in look and in their appeal, check out these two stunning examples. The one on the left is a great example of a brown diamond with pinkish accents, and the one on the right is a fancy dark brown. Both are lovely; it boils down to a matter of preference. The one on the left would look terrific in a rose gold setting and the one on the right would rock a yellow gold setting. To learn more about brown diamonds, and how they differ from their famous, colorless cousin, click this infographic created by AGS Laboratories. It’s filled with fun and exciting facts about diamonds, and further explains what makes them so rare and unique. 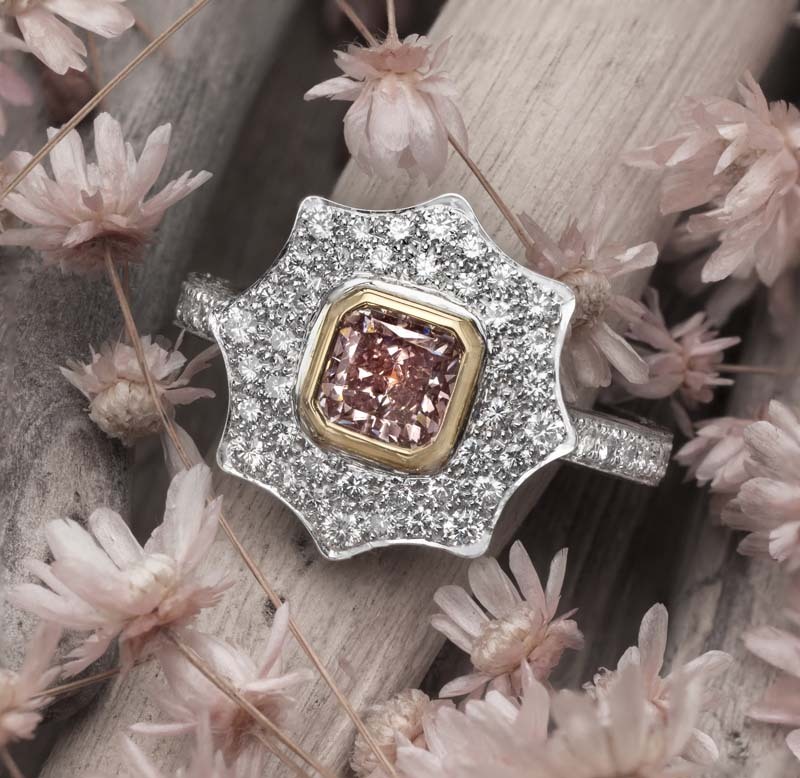 To find an American Gem Society jeweler near you who can help you find a brown diamond to add to your jewelry collection, click here. 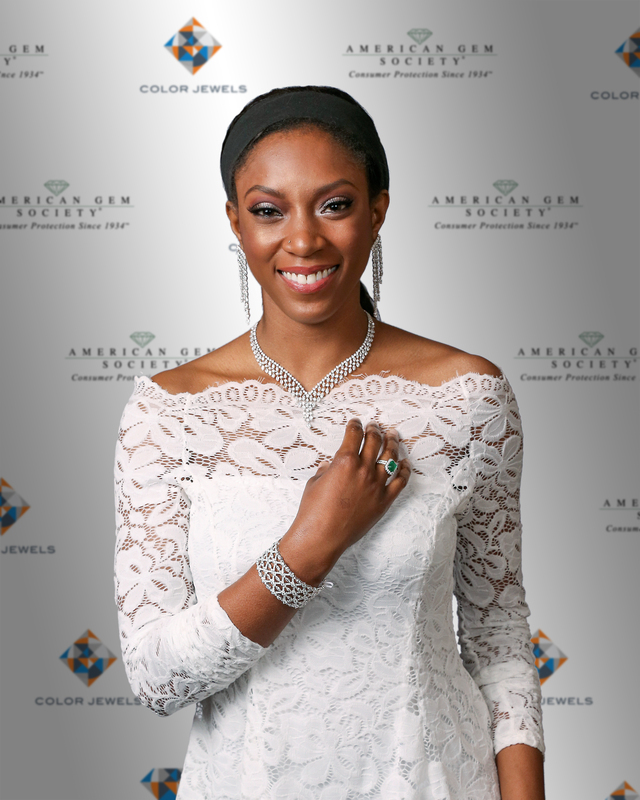 Please also ask your AGS jeweler to show you a diamond with the Colored Diamond Document from AGS Laboratories! The American Gem Society (AGS) Suppliers’ Reception and Showcase occurs annually during the American Gem Society’s Conclave, the industry’s premier educational and networking event. This year’s Conclave was held in Nashville, TN, and the AGS Suppliers’ Reception and Showcase featured 16 AGS members. Below are photos from the highly successful evening, featuring the incredible jewelry and the lovely ladies who modeled them. Click on each photo to get a closer look. 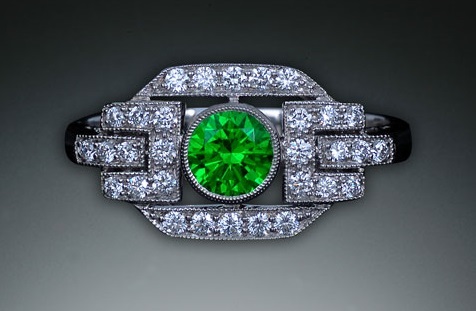 If there’s a design you like and want to know more, contact an AGS-credentialed jeweler near you. 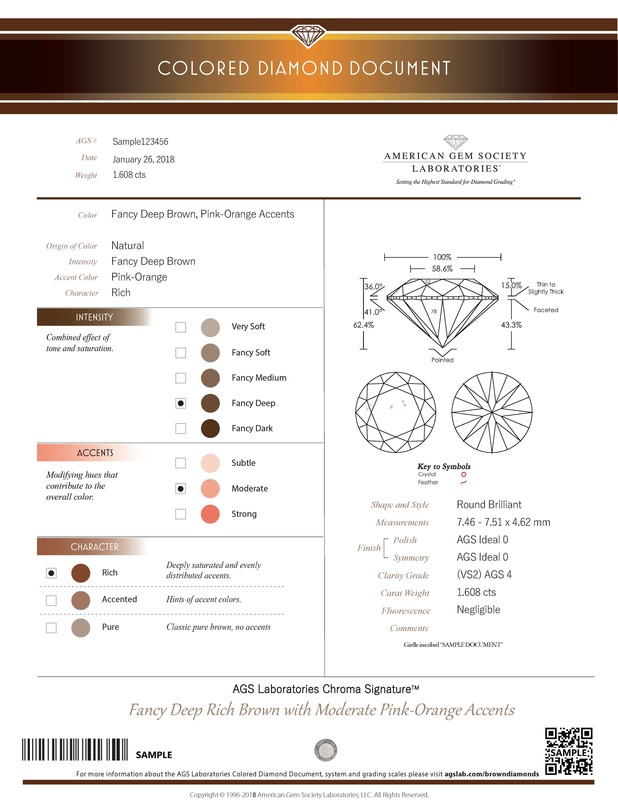 AGS Laboratories recently unveiled their new Colored Diamond Document, a grading report that presents the technical aspects and nuances of colored diamond grading to jewelry buyers with easy-to-understand verbiage and graphics. Brown diamonds will no longer be described simply as “a brown diamond,” but will be communicated in an easy-to-understand visual way, highlighting the nuances within the diamond’s color. 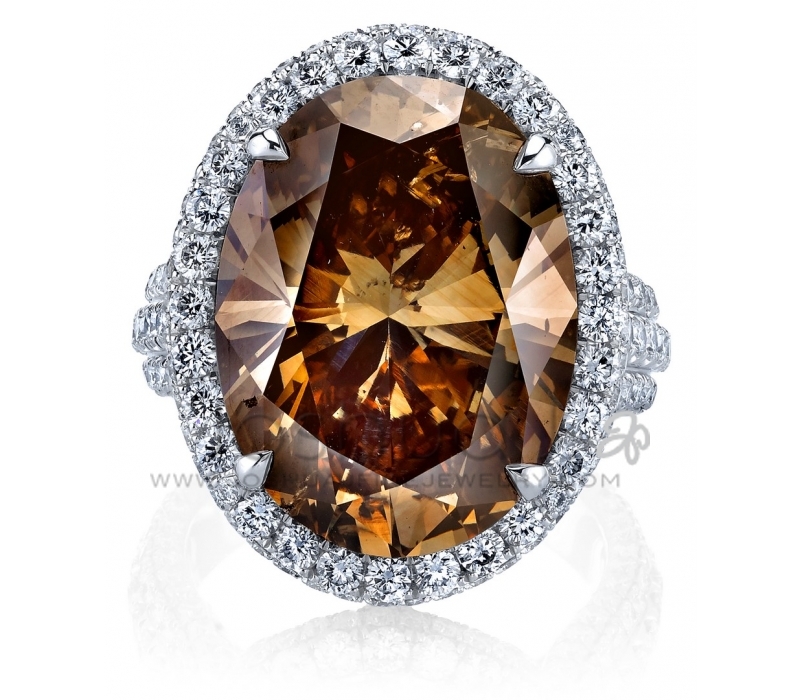 For example, a diamond with even distribution of brown throughout and hints of orange, could be described as a deep, rich, brown diamond with moderate orange accents. 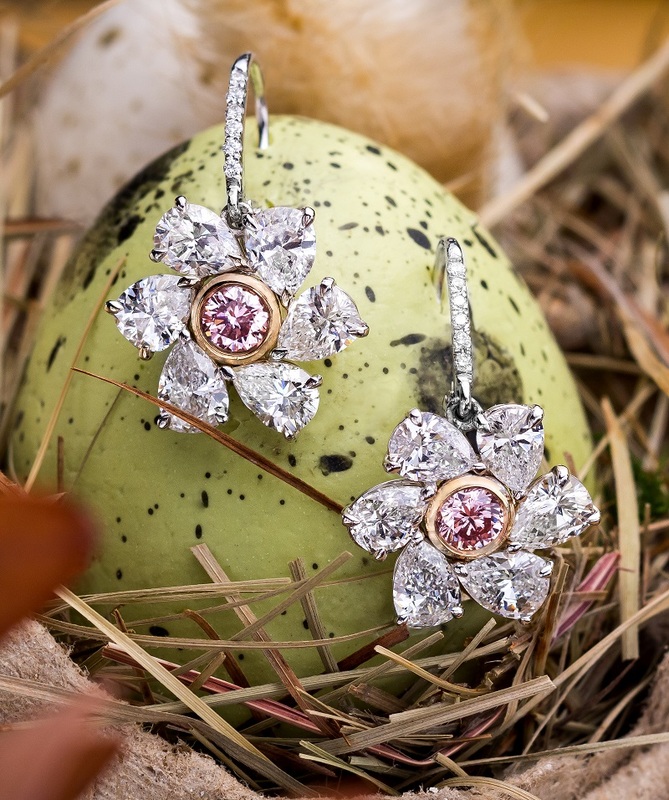 Brown diamond earrings, by ASBA USA, Inc.
Brown diamond ring, by ASBA USA, Inc.
Rose cut marquise brown diamond and champagne diamonds, by Lika Behar Collection. 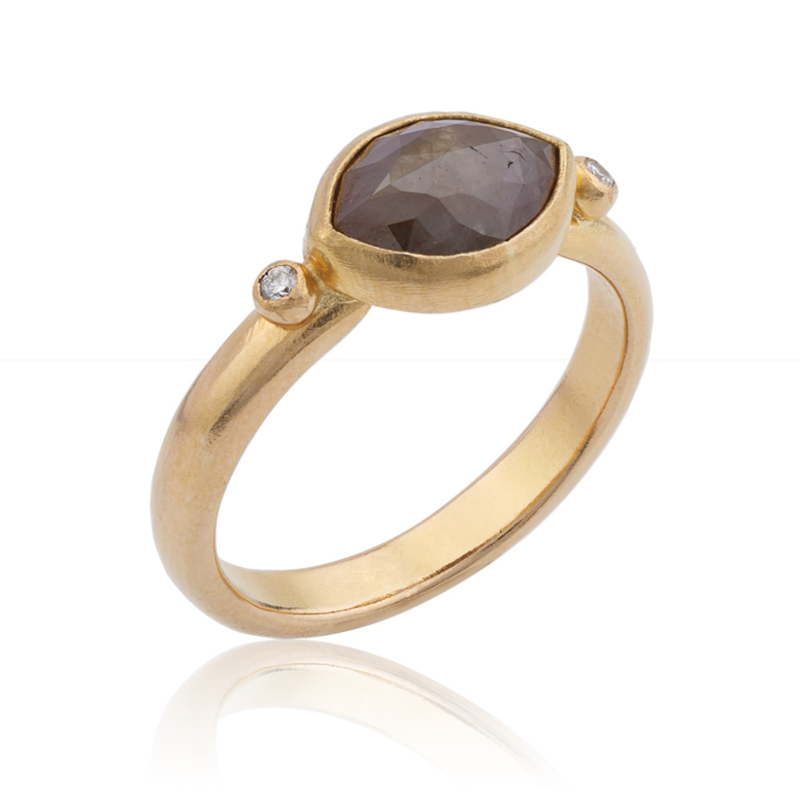 Rose cut brown diamond and two rounded faceted champagne diamonds, by Lika Behar Collection. Blog article and photos courtesy of the American Gem Society (AGS) member, Jeffrey Daniels Unique Designs and Gem Platinum. 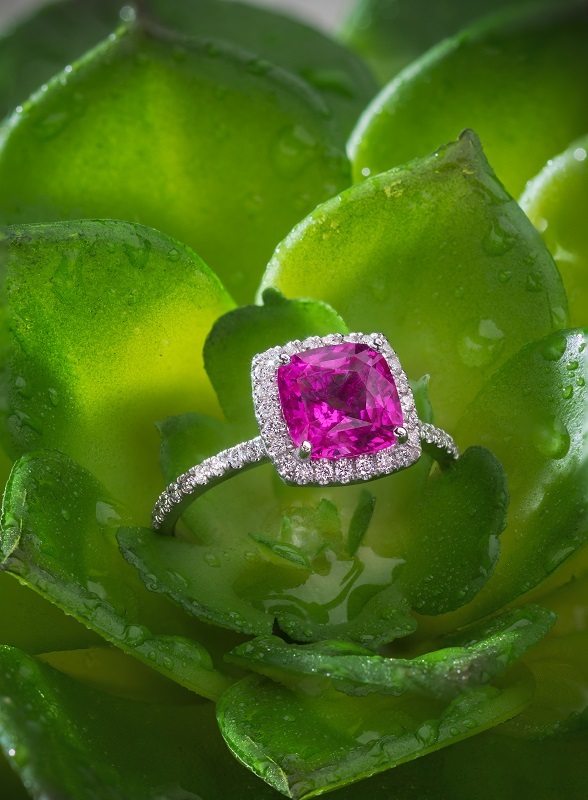 Pretty in pink at Jeffrey Daniels and Gem Platinum means pink sapphires and pink diamonds, with a nod to pink tourmaline. Choose your shade and dive into the fabulous world of pink gemstones. You will never look back. Pink sapphires are the hot sibling of the gracious deep blue most people associate with sapphires. Electric and alive, pink sapphires are the perfect stone for cocktail rings and a night out on the town. Cushion cut pink sapphire with diamond halo. Oval pink sapphire set in a double row diamond halo. Oval pink sapphire set with taper baguette and round brilliant diamonds. Hot pink isn’t just for her, the cabochon pink tourmaline ring shown below brings a bit of fun for him too. 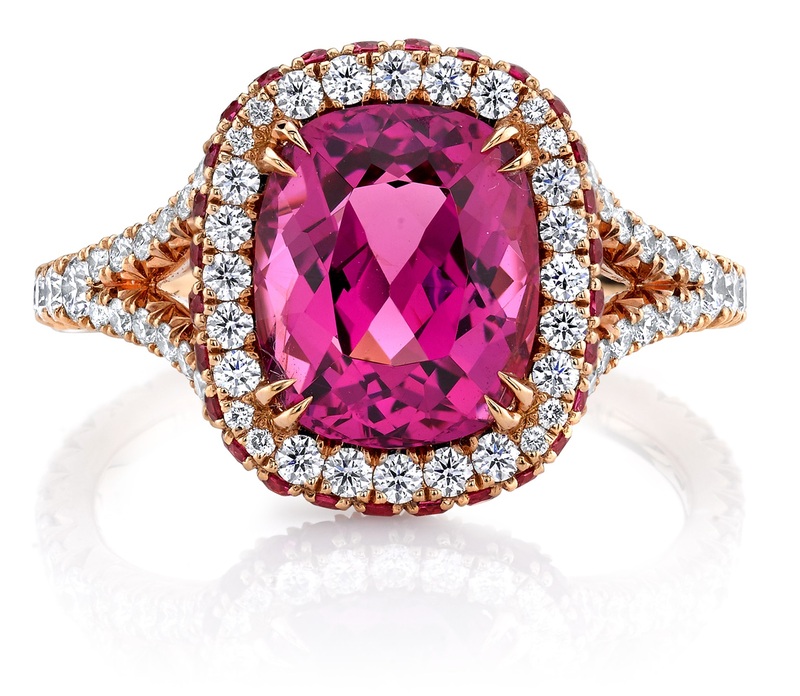 Like the pink sapphire, pink tourmaline is not the color commonly associated with this stone. Pink tourmaline is possibly created through the introduction of radiation to the stone during formation. Magnesium also produces pink and red hues in gemstones. Tourmaline comes in a variety of colors and hues outside the olive green it is commonly associated with. Cabochon pink tourmaline bezel set in rose gold. 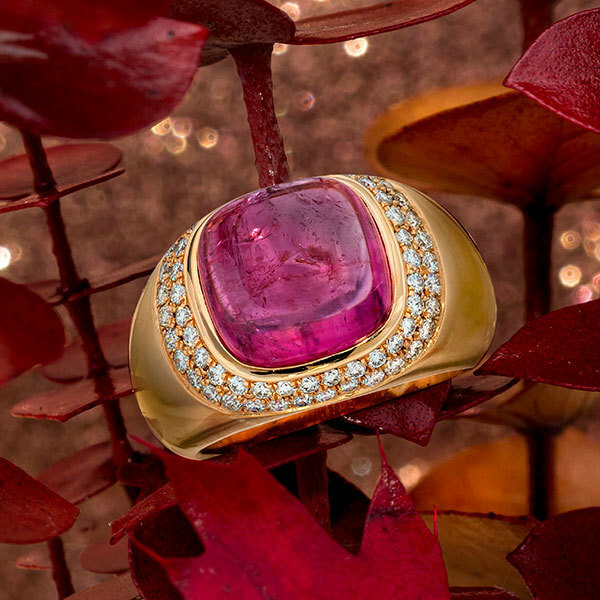 The hot pink stone used in the Jeffrey Daniels design above is one of the best examples of pink tourmaline in both color and clarity. Interestingly, some of the best pink tourmaline comes from the Cryo-Genie Mine in San Diego, CA. 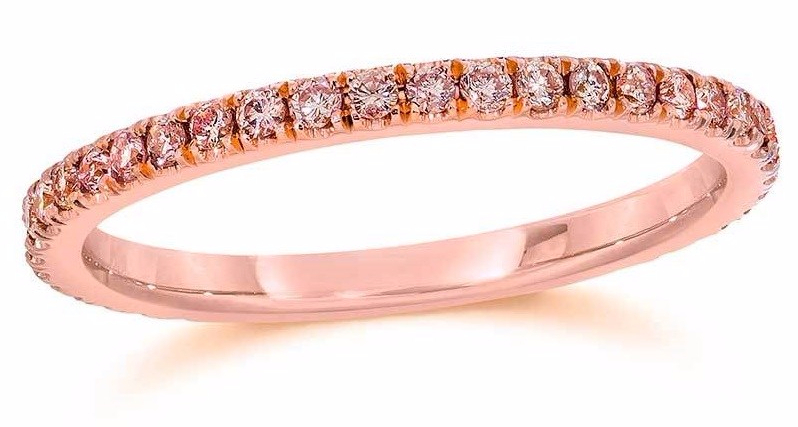 This pink diamond wedding ring from Gem Platinum is a fabulous way to say “I do!” The rose gold setting adds to the elegance and grace of the stones in this eternally classic band. 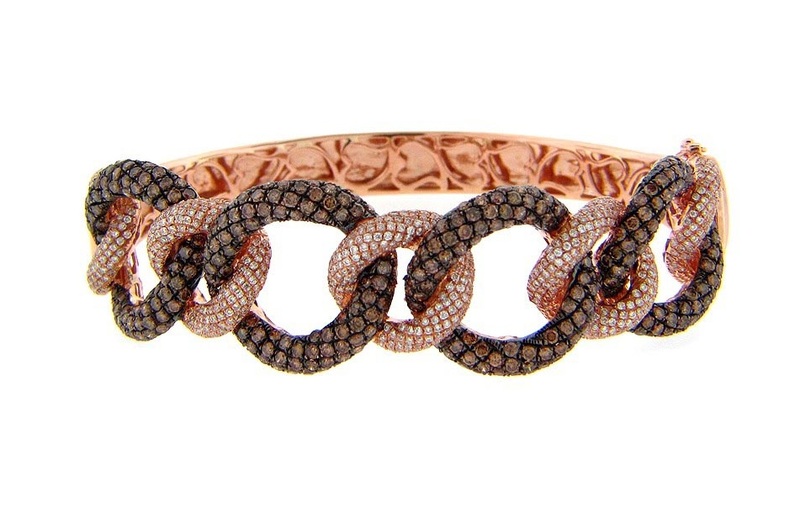 Pave fancy pink diamond eternity band in 18kt rose gold. Pink Diamonds are part of the Fancy Diamond category and they are some of the rarest gemstones available. Fancy pink diamonds are graded according to the depth of their pink color: the deeper the color, the more expensive the stone. 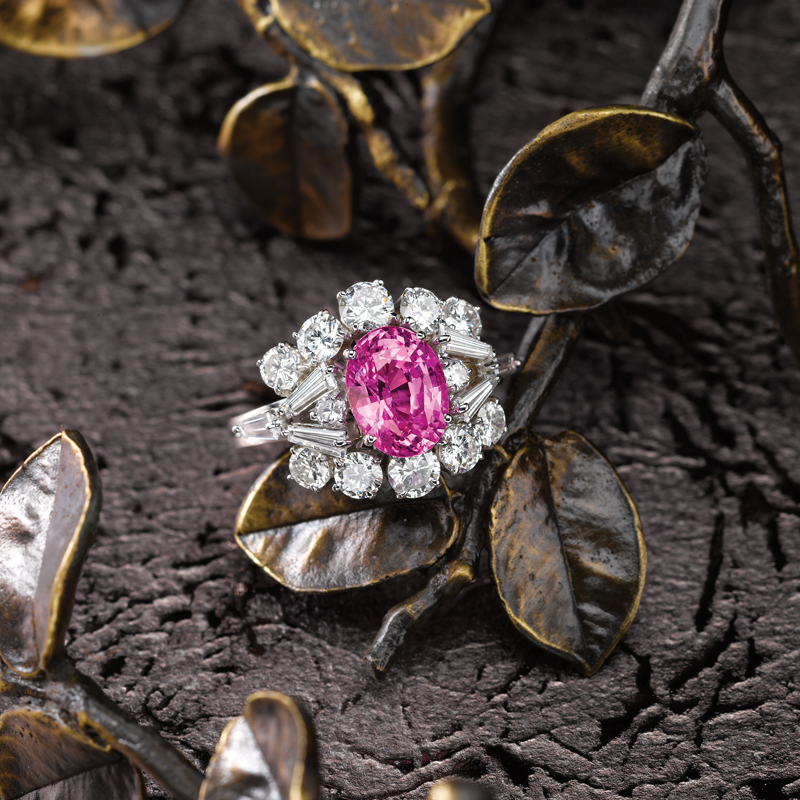 Unlike hot pink sapphires, the pink in diamonds is an elegant pastel shade of pink. Radiation introduced during formation is thought to be the driving force behind the pink color in these diamonds. Known also for their clarity and brilliance, pink diamonds larger than 1 carat are very, very rare. Circular bezel set natural pink diamond bracelet in 18kt gold. 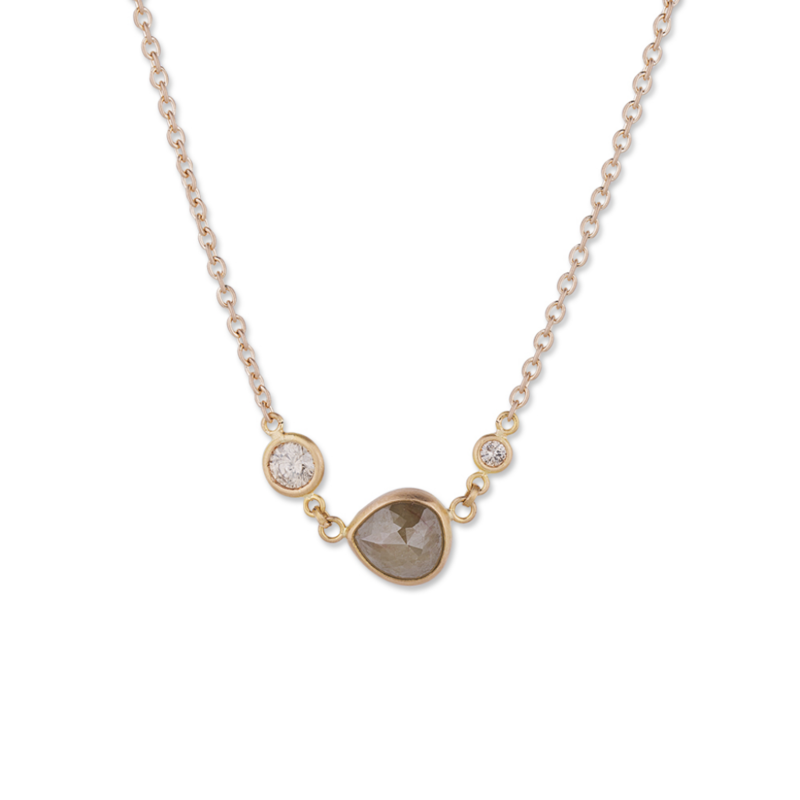 Bezel set pink diamonds surrounded by petals of pear cut white diamonds. Natural fancy pink radiant diamond set in a floral petal design ring in platinum and 18kt gold. If you are looking for a piece of jewelry that will also become an heirloom or an investment, a pink diamond may be the stone of choice. Since its establishment, AGS member, Gem Platinum, has provided only the finest quality, service and value in its jewelry collection. They continue to be in the forefront of fine traditional jewelry design and craftsmanship incorporating only the finest natural diamonds and gemstones. Truly unique gemstones require a truly unique setting for their beauty to be revealed. Jeffrey Daniels Unique Designs has created an extraordinary synergy of these concepts by combining his passion for the unusual with an uncompromising eye for detail and design. This collection of one-of-a-kind jewels are the result as no two pieces will ever be alike. 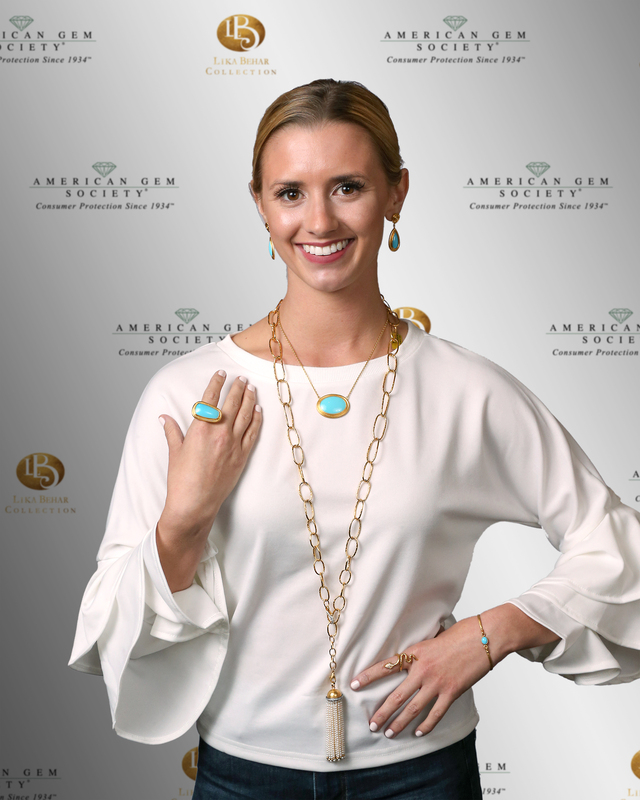 It’s one thing for us to tell you to shop with an American Gem Society (AGS) jeweler, it’s another thing to actually see why shopping with a trusted, AGS jeweler is so important. To view our short “We’re an AGS Jeweler” video, click the image below. Are you ready to find an AGS Jeweler near you? Click here to get started!